BTV: Myers joins leadership group Essendon midfielder David Myers speaks to BomberTV about his elevation to the leadership group. Off the back of an impressive 2013 in the Essendon midfield, David Myers has been elevated to the club’s leadership group for the upcoming season. Myers will join captain Jobe Watson, Brent Stanton, Heath Hocking, Brendon Goddard, Jason Winderlich and Dyson Heppell as the Bombers on-field leaders. The 24 year-old said the added responsibility was an incredible privilege. “You go about your football to try and prepare the best you can but to get the tick of approval from your teammates is really exciting. Senior coach Mark Thompson said the addition of Myers was recognition of his respect among the playing group. “We think David is a fantastic person to have at our football club and it pleasing to see him elevated to the leadership group for next season,” Thompson said. Myers was drafted to the club in 2007 with pick six in the National Draft from Perth in the WAFL. 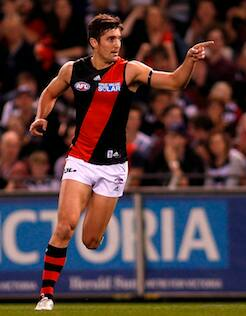 He has played 65 games since making his debut for the Bombers in 2008. The 24-year-old recently signed a two-year contract extension that will see him remain in the red and black until the end of 2016. Michael Hurley and David Zaharakis will not be a part of the reduced leadership group. Join the Bomber army today as we strive for 60,000 members in 2014. Don't drop the ball when it comes to your career. You could become a Personal Trainer with Dyson Heppell, Mark Baguley, Tayte Pears and Michael Hibberd at Australian Institute of Fitness. Contact the Institute on 1300 669 669 or visit www.fitness.edu.au.